Pricing is yet to be announced for a vehicle that should go on sale by March 2006, but Toyota promises that base models will start in the mid-$20,000 range and that a well-equipped 4×4 will be available in the low $30,000s. While the engineering and manufacturing of the Toyota FJ Cruiser are done in Japan, the vehicle's design and product planning were created in Southern California. The design evokes the heritage of the FJ40 and other early Land Cruisers without being retro. This is no simple cloning of a nearly half-century old design. Instead, what Toyota wanted to do was to project how the original and Jeep-like FJ would have evolved had it remained in production all these years. The early FJs and Land Cruisers were patterned on the World War II Jeep because the U.S. Army asked Toyota to build a newer version of the versatile vehicle for use in the Korean conflict. That vehicle also was used by Japanese police departments. Then, much like the original Jeep, it became a civilian vehicle known as the FJ in Japan and as the Land Cruiser in foreign markets, including the United States. 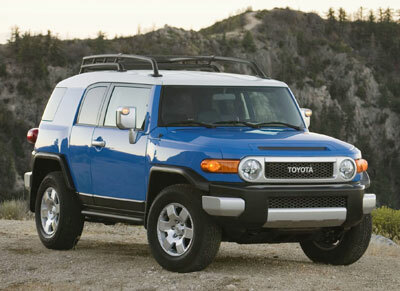 Exterior styling cues from the original FJ brought forward on the FJ Cruiser include a narrow slot of a second grille built into the front lip of the hood, the trio of windshield wipers at the base of an upright windshield, the round headlights and the metallic-colored enclosure that frames them and the word Toyota (instead of the interlocking oval emblem that adorns the face of other Toyotas), the white roof, the wraparound rear windows and the spare tire mounted on the back of the vehicle. The FJ Cruiser shares much of its under structure with the Toyota 4Runner four-door SUV and Tacoma pickup truck, but you'd never guess that to look at the new vehicle with its wide turtle-shell body design. Short front and rear overhangs are used for serious off-road maneuvering. The 4×4 versions offer 9.6 inches of ground clearance, with optional underbody body armor to provide extra protection against rocks and other obstacles met on unpaved trails. Though it may look like a two-door, the FJ Cruiser actually has four doors, opening almost French door style on either side to create a good-sized opening for access to the back seat and cargo area. The rear door also opens wide, and features a backlight glass that can be opened even when the door itself is closed. The FJ Cruiser features an interesting color palate including a bright blue (Voodoo Blue) and yellow (Sun Fusion), as well as a silver (Titanium Metallic), black (Black Diamond) and deep and dark purple (Black Cherry). But that paint only covers the hood, fenders, body sides, C-pillars and rear door. In homage to the old FJ40s, the FJ Cruisers have white roofs. Like the exterior, the interior of the Toyota FJ Cruiser reflects the character of the early FJs, especially with its machined-look dashboard and with the optional body-colored door panel inserts. The dashboard looks like an extruded aluminum beam. Audio and climate controls are set into a body-colored panel in the center of the dash, and similar body-colored accent panels for the interior doors figure to be a popular option. If you want leather seats, you don't want an FJ Cruiser, which comes only with water-resistant cloth-covered seats with rubberized floor and cargo mats. The expectation is that people who drive FJ Cruisers will get them dirty, and want the easy cleanup provided by such materials. The driver faces white-faced gauges (speedometer, tachometer, engine temperature, voltage and fuel level) that are easy to read. In addition to the regular glove box ahead of the front passenger seat, there's a smaller covered storage box on top of the instrument panel in front of the driver. This area can be equipped with an optional Garmin Quest 2 navigation unit that can be removed from the vehicle for hiking or other activities. Another option is a trio of gauges (outside thermometer, compass and inclinometer) that sit on top of the center of the dash. There are cup holders in the center console and four doors. A 12-volt outlet is mounted on the switch panel ahead of the shifter with a three-prong, grounded 115-volt power outlet in the cargo area with a switch for either 100 or 400 watts of output (the higher figure available when the vehicle is at idle). The rear seatback splits 60/40 to optimize cargo carrying options. The rear seat cushion tips forward and can be removed to provide a few more inches of cargo area behind the front seats. The standard audio system includes a CD player and iPod and MP3 capability as well as two ceiling-mounted speakers designed to enhance the sound experience within the FJ Cruiser. An optional FJammer audio system includes a factory-installed eight-inch subwoofer and a pair of 2.6-inch speakers mounted on the rear pillars. Because the FJ Cruiser has wide C-pillars that may interfere with the driver's rearward vision, an optional rear sonar system is available to warn the driver of the proximity of objects when the transmission is in Reverse. We had no trouble parking the FJ in urban settings on our test drive, nor did we have to move into strange positions to see stoplights through the upright windshield. The FJ Cruiser is rated to tow as much as 5000 pounds, 500 pounds more than the H3 and 4000 more than the Jeep. The Toyota V6 not only is strong, but clean and fuel-efficient as well. It earns the FJ Cruiser a LEV-II (low-emission vehicle) rating from the federal government and, depending on drivetrain configuration, returns around 16-18 miles per gallon in city driving and up to 22 on the highway. As mentioned, three versions are available. Those planning to do serious off-road driving will want the full-time 4×4 with the manual transmission, which features a clutchless starting feature that can come in handy for rock-crawling maneuvers. Those looking for an automatic likely will select the part-time 4×4 with its automatic transmission. It's a good choice regardless of road and weather conditions. It's also a good choice for rugged terrain and is available with Toyota's new A-TRAC off-road technology. Drivers who don't need to venture too far from paved roads but who like the unique design statement made by the FJ Cruiser will likely opt for the two-wheel-drive setup. Toyota anticipates more than 90 percent of FJ Cruiser buyers will select one of the 4×4 versions. With the automatic transmission, the system offers shift-on-the-fly selection with H2 (2WD High range), H4 (4WD High range) or L4 (4WD Low range) settings for the torque-splitting transfer case. With the manual transmission, the drivetrain is a full-time four-wheel-drive setup with H4, H4L (locked Torsen center differential) and L4L (low and locked) settings. The H4 mode usually sends 60 percent of power to the rear wheels, but can send as much as 53 percent of power to the front wheels or 70 percent to the rear wheels as needed. An electronically locking rear differential is available with either automatic or manual transmission, or even in the two-wheel-drive version. Also available with four-wheel drive is a computer-controlled traction system that Toyota calls A-TRAC, for Active-TRACtion. This system, which also makes steering easier in rugged terrain, can be turned on or off via a switch on the dashboard control panel. In severe off-road situations, drivers may need to engage the locking rear differential, but we found the A-TRAC system ideal for negotiating a series of serious and deep moguls in steep terrain when we did our off-road test drive. With the manual transmission, the FJ Cruiser has an off-road crawl ratio of 41.84:1 and has proven itself capable to traversing California's rugged and world-famous Rubicon Trail. Toyota anticipates that many FJ Cruiser owners will want to explore away from pavement, but most miles will be racked up on city streets and suburban highways, where we found the FJ Cruiser to be comfortable, even when we sat in the back seat. One thing we did notice, however, was that the big roof rack that's available as an accessory can create a lot of wind noise at Interstate speeds. We still think lots of people will want one, however, if for no other reason than it looks so cool. The FJ Cruiser is Toyota's newest sport utility vehicle and its most capable when it comes to getting where you want to go when there's no pavement beneath your tires. Like Hummers and Jeep Wranglers, the FJ Cruiser isn't for everyone. Not everyone will appreciate its heritage, whether in the iconic design cues brought forward in a thoroughly modern vehicle or in the way this vehicle lives up to the Land Cruiser's much deserved reputation for getting across deserts, up mountains and through swamps and jungles on continents around the globe. But for those whose lifestyles include exploring, whether it be sandy beaches, mountain trails, secluded lakes, busy ski hills or even the urban jungle, the FJ Cruiser provides Toyota quality at a competitive price and wrapped in a unique design, inside and out. Standard equipment: 265/70R17 tires on black steel wheels with full-size spare mounted on rear swing door; Vehicle Stability Control; air conditioning; AM/FM/CD audio with two ceiling speakers; tilt steering wheel; 4 cup and 2 bottle holders; passenger seat-back pocket; standard and upper dash map/glove boxes; power windows/locks; white roof; variable intermittent wipers; rear window defogger; dual-stage front airbags; water-resistant seat fabric; rubber-like floor and deck material; 8-way adjustable driver's seat; 4-way adjustable front passenger seat; automatic disconnect differential (limited slip differential on 2WD version); removable rear seat cushion. Head/hip/leg room, f: 41.3/55.4/41.9 in. Head/hip/leg room, r: 40.3/51.0/31.3 in. Cargo volume: 66.8 cu. ft.